Like many pastoral peoples around the world, herders in Mongolia struggle to maintain their ethnic identity and lifestyle while the world around both changes and encroaches on their traditional lands. This article in the New York Times, Ethnic Protests in China have Lengthy Roots, updates their economic and political situation. Will their survival depend on being 'less Mongolian' and 'more 'Han Chinese'? Such disparate peoples as the Tinkers of Ireland, the !Kung of the Kalahari Desert and the Bedouin in Israel, Jordan and Egypt have struggled to maintain economic solvency and social, familial and religious traditions as minority peoples in the nations in which they reside. The Mongolians also find their livelihood threatened by a recent rise in average temperatures (see video above). While policies enacted by the Chinese to settle the traditionally nomadic Mongolians have led to educational opportunities, this move had also contributed to increased levels of poverty, environmental degradation and a loss of social traditions, including their language. For a look at the link between language and culture, try Pidgin and culture in Nigeria. 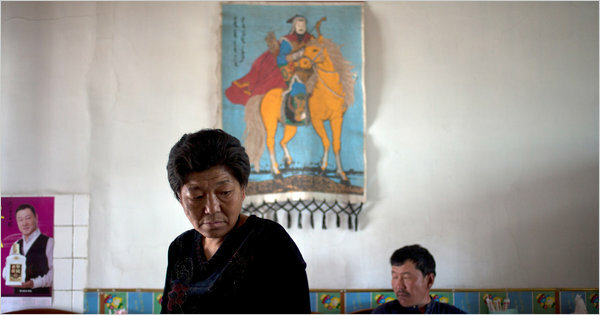 “We feel lost without our herds and the grassland,” said Uyung, left, with her husband, Suyaltu, at the small canteen they run in a town in Damao Banner, China.